A woman looks onto her street being dug up near a construction site, where a garage, park, and tunnel are planned. 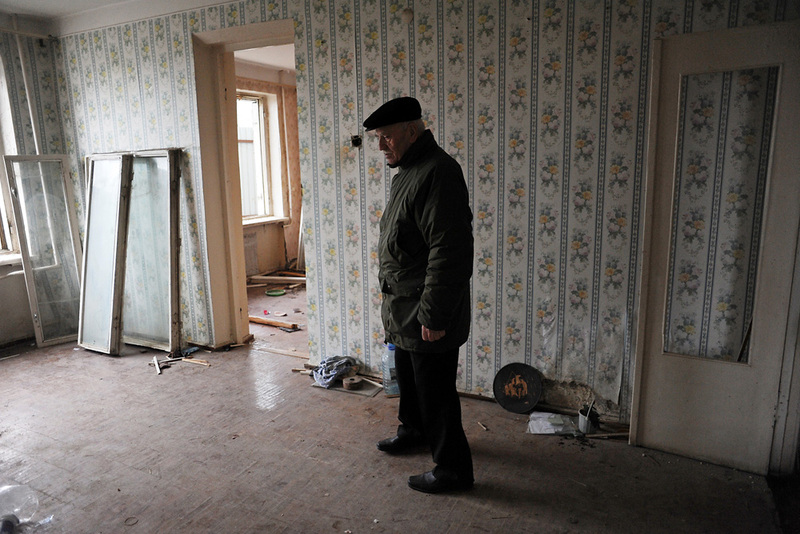 Khaliq Bagirov stands in the shell of his former living room in his partially demolished apartment on Agil Guliyev Street. The construction site in front of the Government House in Freedom Square reveals where a parking garage is planned. 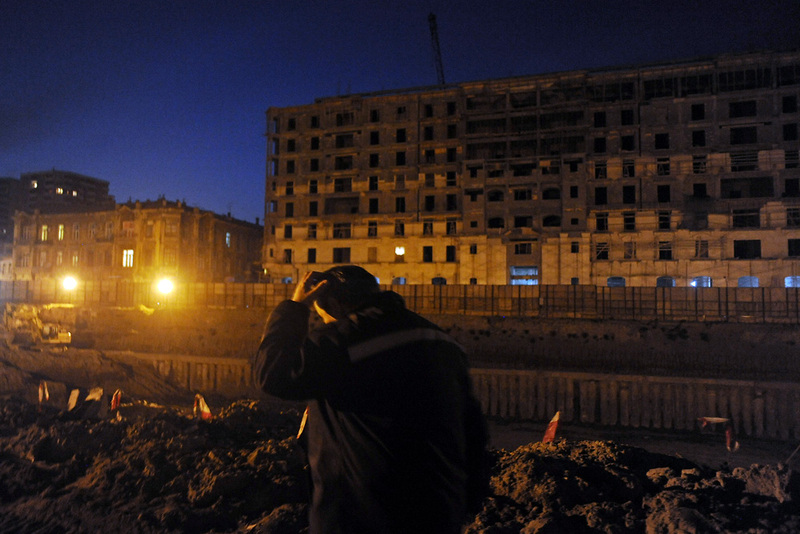 Workers dig on a construction site near Statistika in Baku. Young customers arrive at the opening of Emporium's second store at the still under construction Port Baku luxury residences. A newly built road leads to Crystal Hall, the planned site of the Eurovision Song Contest. 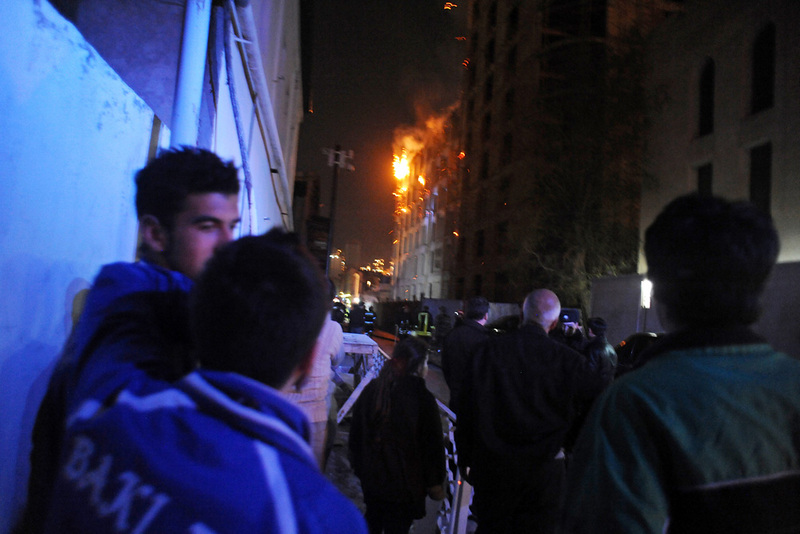 Residents watch firemen attempt to douse a fire after a gas explosion in a new development sent 10-meter flames skyward. The development of highrises has given way to "finger buildings," which stand out amidst neighboring low-rise structures. 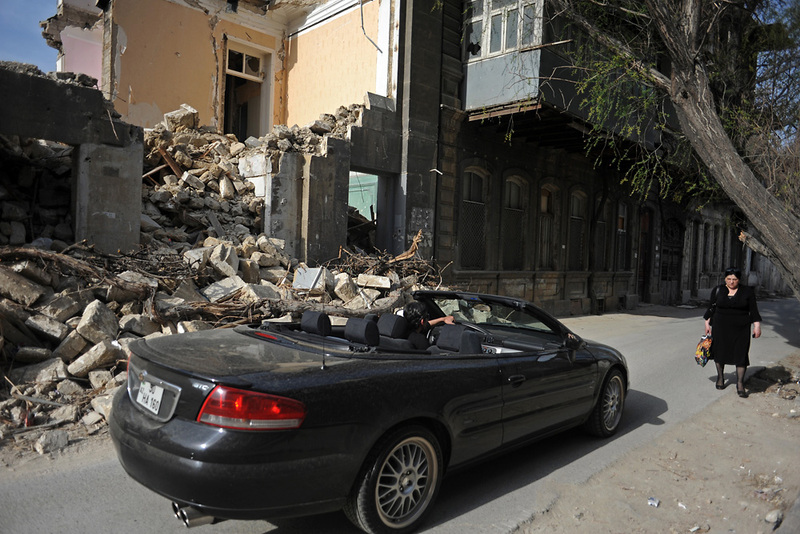 A man drives by in a convertible as a woman walks down the street beside a demolition site. A supervisor walks near a construction site where the government forced the eviction of many people to make way for the project. 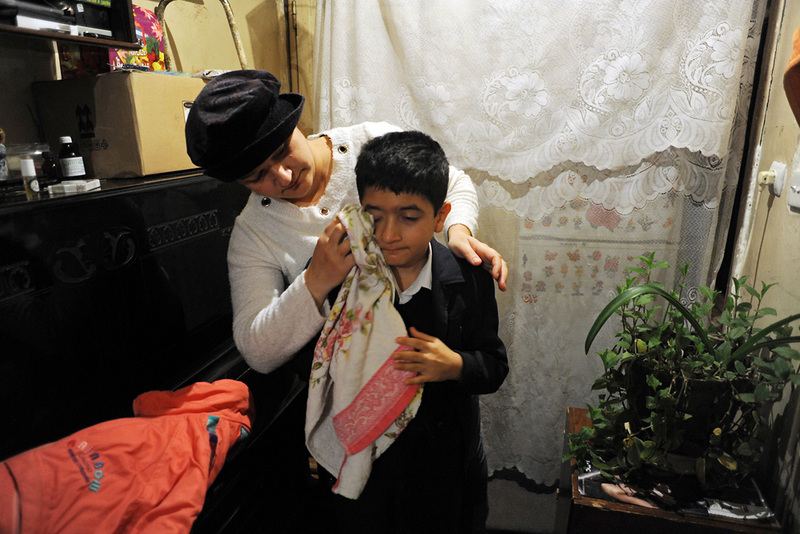 Gulnar Rzayeva and her son, Suleyman Rza, live in one of the last freestanding and undemolished homes on their block. 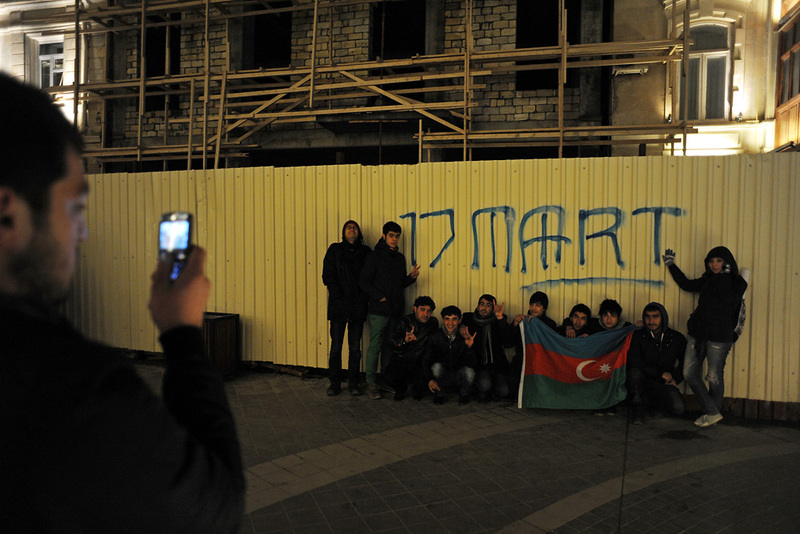 Near a construction site, young Azeris pose for a photo after holding a rally against the mass demolition work by the city. 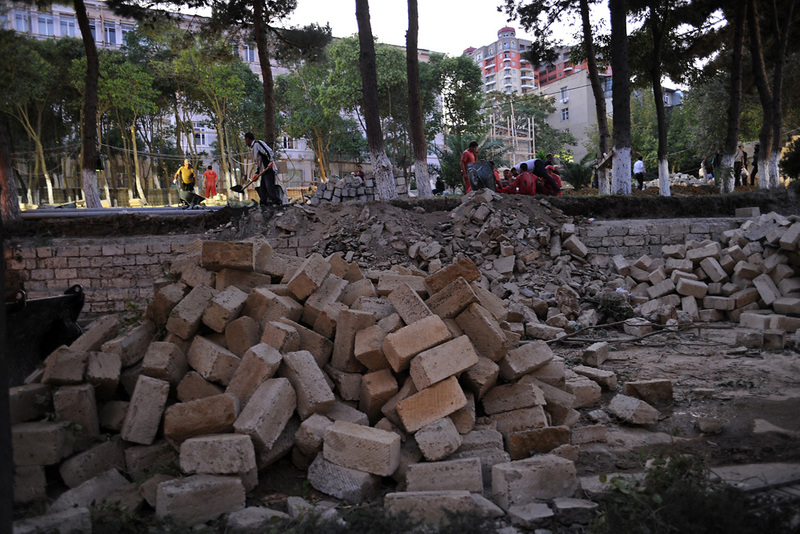 Several families were evicted in order to begin the construction project in the Besh Mertebe neighborhood of Baku. 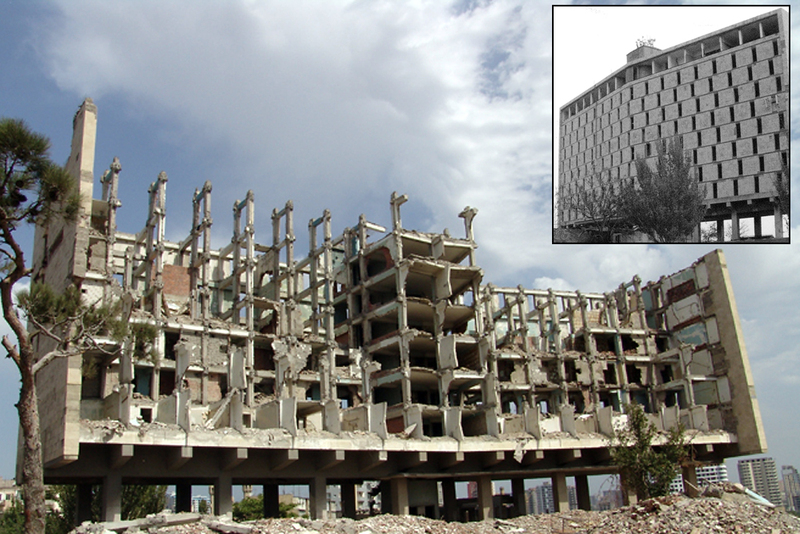 Does urban renewal signify progress? That question has dogged city planners worldwide for decades. 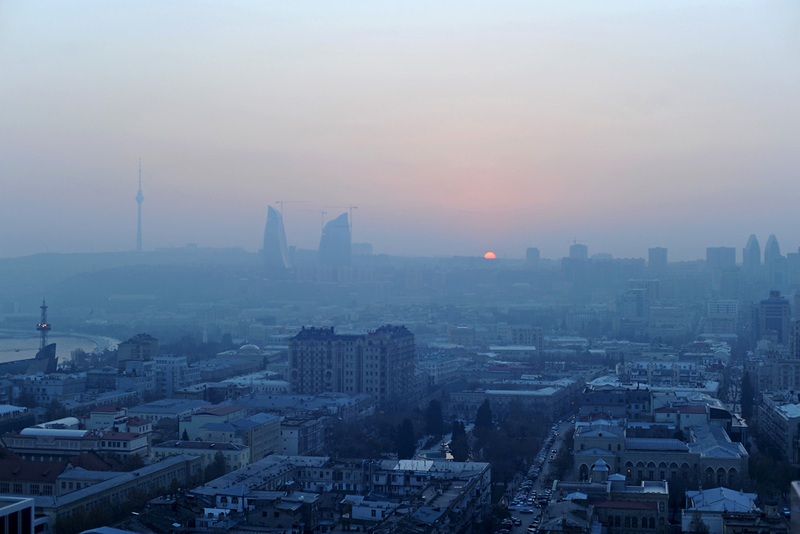 And nowhere is the matter more pertinent these days than in Baku, the Caspian seaside capital of Azerbaijan. 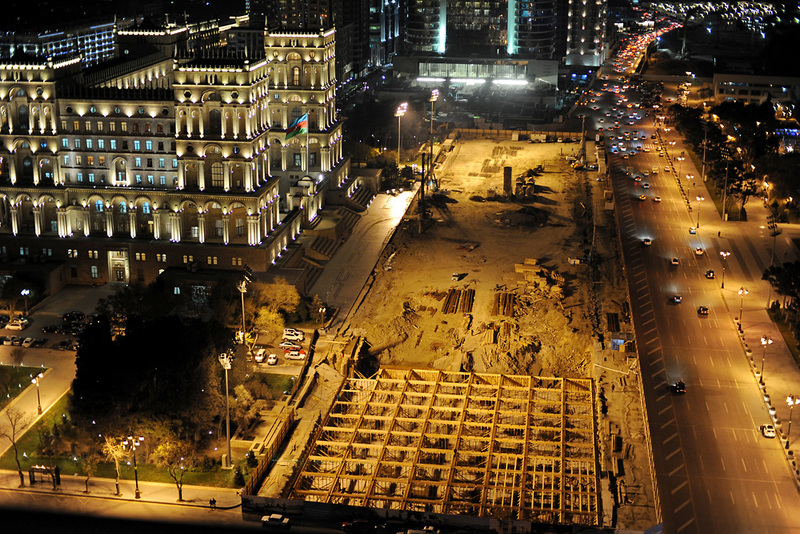 Thanks to a massive cash infusion generated by energy exports, Baku has experienced a building boom over the past decade. Amid the makeover, scores of buildings with distinctive architectural attributes, some of them registered with UNESCO as having historical value, have fallen victim to the wrecking ball. 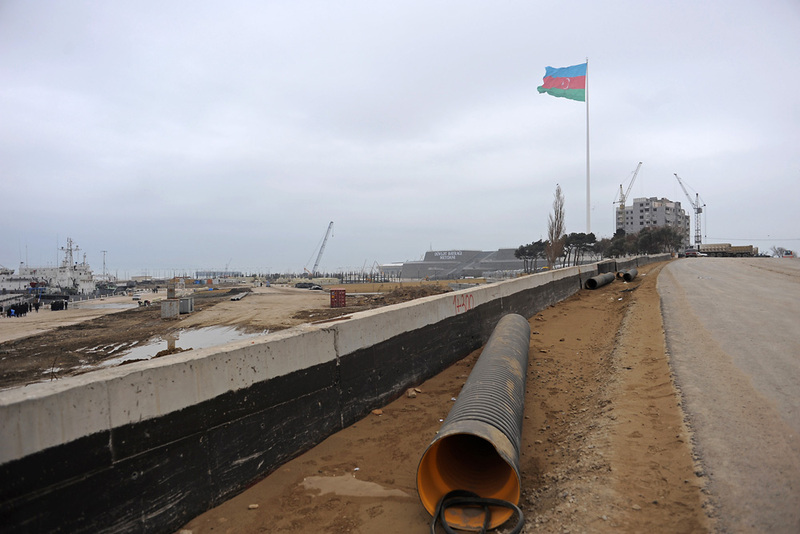 With international attention now focusing on Baku, which will host the Eurovision song contest finals from May 22-26, authorities are hoping the new construction will help project an appealing image of Azerbaijan to the outside world. At the same time, advocates of preservation are intensifying efforts to call attention to what they consider to be architectural crimes. “Historical buildings in Baku are being destroyed with as much brutality and hatred as if the Taliban are demolishing a statue of Buddha,” fumed Altay Goyushov, a history professor at Baku State University. 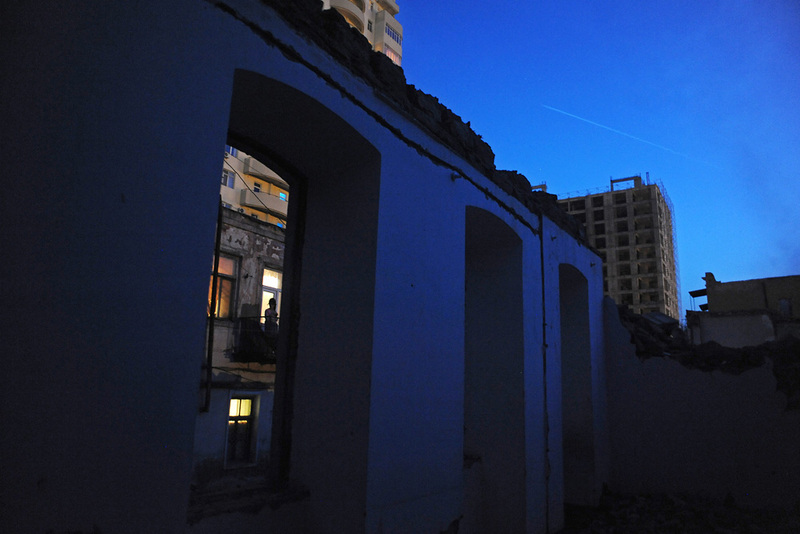 As part of an official “reconstruction” effort, more than 30 buildings have been demolished over the past few years within Baku’s walled Old City (Ichari Shahar), a maze of atmospheric cobblestone streets twisting around the 15th century Shirvanshah Palace. The Old City is listed as a UNESCO World Heritage Site. Most of Baku’s historical buildings were built at the end of the 19th century, a time when Azerbaijan was enjoying its first oil boom. Architects of the era left their mark with grandiose porticoes and whimsical ornamentations. During in the early Soviet era, another interesting architectural layer was added in the form of the Constructivist style. The structures that are rising today tend to be made from steel and glass, marking a drastic break with all previous traditions. A promo video for the Eurovision song contest touts the changes underway as “one of the most exciting and cutting-edge transformations in the world.” Points of pride include the 50,000-square-meter Heydar Aliyev Cultural Center; the Star-Trek-style, 182-meter-tall Flame Towers; the 25,000-seat Crystal Hall, Eurovision’s main venue; and a four-storey carpet museum shaped like an unfolding carpet. A watershed moment for historic preservationism in the United States occurred in 1964 with the demolition of Pennsylvania Station in New York City. 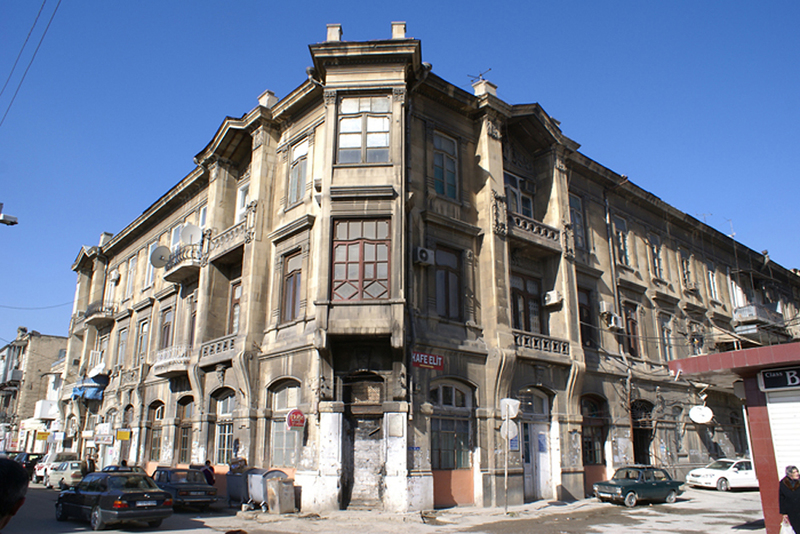 Some in Baku are hoping that the destruction of the the 110-year-old House of Atlantis -- a fanciful downtown residential building by Polish architect Iosif Ploshko, which featured two Hercules-style statues supporting the central facade on their shoulders -- will serve as a similar rallying point for those striving to save Azerbaijan’s cultural heritage. By law, registered historical buildings can be taken down only if they are on the verge of collapse and pose a public danger. These criteria, however, are not known to apply to the House of Atlantis or many of the other demolished structures. Rather, location -- the House of Atlantis occupied prime real estate -- is often believed to prompt their demolition. 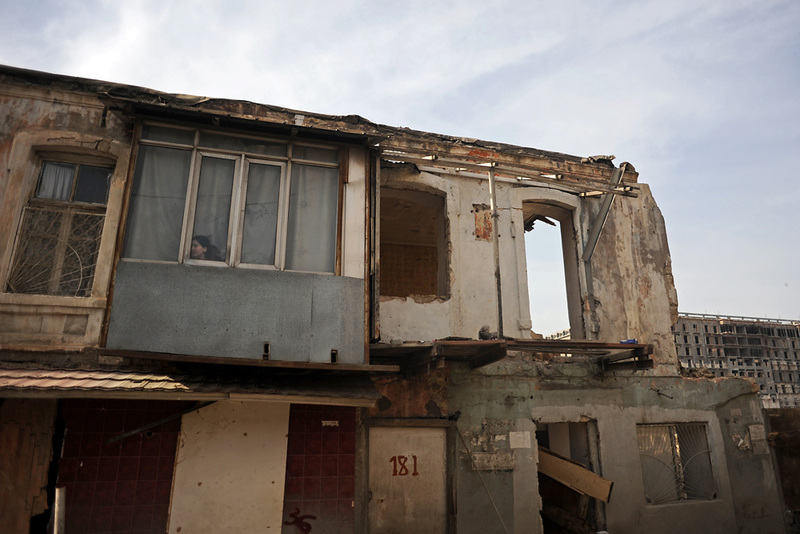 Demolition of historic buildings is supposed to proceed only with authorization from the Cabinet of Ministers. But it’s difficult to verify whether procedures are being followed. Officials are not eager to discuss demolitions publicly. A spokesperson for the Cabinet of Ministers could not be reached for comment, and a Baku city representative declined to speak with EurasiaNet.org about the matter. The Ministry of Culture and Tourism, which is charged with preserving historical buildings, referred reporters to the Baku city government. Those property owners displaced by the makeover are entitled to government compensation. But the amounts offered aren’t always commensurate with market valuations. In many cases, police have simply evicted property owners who refused to leave their apartment, and accept the compensation. 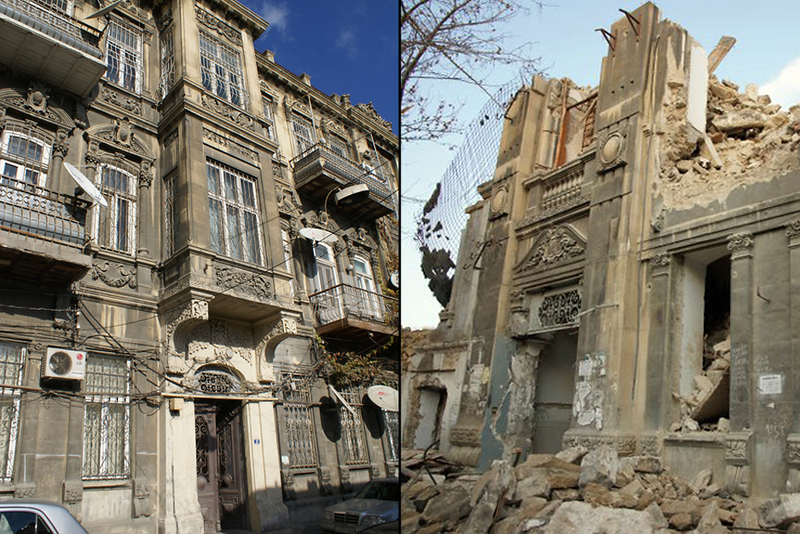 The battle over preservation in Baku will soon head into the courts. The Public Control Committee, a group of 37 non-governmental organizations, is calling on the Constitutional Court to rule on an urban renewal effort. The suit concerns the downtown Agayev neighborhood, where 17 historical buildings on Shamsi Badalbayli Street have already come down, and another 26 are reportedly slated for destruction on nearby Fuzuli Street, according to one historical preservation group. In their place will stand, the Winter Boulevard, an esplanade with trade centers and underground parking, which is scheduled for completion in 2013. The legal case is more symbolic than substantive, some of the plaintiffs quietly acknowledge. Given that Azerbaijan’s judicial system is widely seen as subservient to the executive branch, there is no expectation that the court will side with preservationists. Besides, most of the architectural damage to the neighborhood has already been done. The Control Committee’s coordinator, Aytekin Imranova, would like to see the international community, especially UNESCO, get more involved in Baku preservation efforts. UNESCO has not responded to communications about the destruction of Old City buildings, she added. UNESCO could not be reached for comment. Khadija Ismayilova and Ulviyya Asadzade a freelance reporters based in Baku. Amanda Rivkin is currently working on a Fulbright photography project documenting the role of women in Azerbaijan.